Human CD1d molecules present an unknown ligand, mimicked by the synthetic glycosphingolipid α-galactosylceramide (αGC), to a highly conserved NKT cell subset expressing an invariant TCR Vα24-JαQ paired with Vβ11 chain (Vα24+Vβ11+ invariant NK T cell (NKTinv)). The developmental pathway of Vα24+Vβ11+NKTinv is still unclear, but recent studies in mice were consistent with a TCR instructive, rather than a stochastic, model of differentiation. Using CD1d-αGC-tetramers, we demonstrate that in humans, TCR variable domains other than Vα24 and Vβ11 can mediate specific recognition of CD1d-αGC. In contrast to Vα24+Vβ11+NKTinv cells, Vα24−/CD1d-αGC-specific T cells express either CD8αβ or CD4 molecules, but they are never CD4 CD8 double negative. We show that CD8αβ+Vα24−/CD1d-αGC-specific T cells exhibit CD8-dependent specific cytotoxicity and have lower affinity TCRs than Vα24+/CD1d-αGC-specific T cells. In conclusion, our results demonstrate that, contrary to the currently held view, recognition of CD1d-αGC complex in humans is not uniformly restricted to the Vα24-JαQ/Vβ11 NKT cell subset, but can be mediated by a diverse range of Vα and Vβ domains. The existence of a diverse repertoire of CD1d-αGC-specific T cells in humans strongly supports their Ag-driven selection. The non-MHC encoded, β2-microglobulin-associated CD1 molecules present glycolipids and phospholipids to T lymphocytes (1). According to their amino acid sequence homology, the four CD1 isoforms expressed in humans segregate into two groups. In group 1, CD1 molecules containing CD1a, CD1b, and CD1c are expressed in humans, but they are absent in mice and rats (2). In contrast, the group 2 CD1 molecule, CD1d, is highly conserved in all mammals studied so far (3). Group 1 CD1-molecules present either endogenous or microbial glycolipids to T lymphocytes expressing diverse TCRα- and β-chains, including various V and J segments (4). In contrast, the major human CD1d-restricted T lymphocyte subset so far identified expresses an invariant TCR Vα24-JαQ chain paired with Vβ11 and recognizes the synthetic, marine sponge-derived glycolipid α-galactosylceramide (αGC)4 (1, 5). The great majority of these Vα24+Vβ11+ T cells coexpress the NK locus-encoded C type lectin NKR-P1 (CD161) and therefore are often referred to as invariant NK T cells (NKTinv) (1). The murine counterpart of human Vα24+Vβ11+NKTinv cells expresses NKR-P1C (NK1.1) and recognizes the CD1d-αGC complex through an invariant TCR Vα14-Jα281 chain in association with a restricted family of polyclonal Vβ domains (6). All CD1d-αGC-specific NKTinv cells so far described are either CD4+, CD8αα+, or CD4−CD8− double negative (DN), while CD8αβ+NKTinv cells have never been described, and are thought to be deleted during ontogeny due to their high binding avidity to CD1d molecules (7). NKTinv cells are capable of rapidly secreting large amounts of regulatory cytokines, such as IL-4 and IFN-γ. Consistent with a regulatory role of NKTinv cells in vivo, development of various autoimmune diseases in mice and humans has been associated with a decrease in the frequency of peripheral NKTinv cells (8, 9, 10). Several lines of evidence have recently been generated which suggest that NKTinv cells derive from common mainstream precursor thymocytes, rather than from separate precursor cells committed to this lineage before variable gene rearrangement. First, the pairing of the invariant Vα-chain with a particular Vβ-chain is not forced by molecular constraint (11); and second, the unused TCRα and γ loci of NKTinv cells are indistinguishable from those of mainstream T cells (12, 13). Therefore, the driving force for the selection of these cells may not be genetic programming, but rather Ag specificity. In agreement with a mainstream precursor (or TCR instructive) model, it has recently been suggested that mouse NKTinv cells go through a CD4+CD8+ double positive stage during thymocyte development (14). We reasoned that if Ag-driven selection was responsible for in vivo expansion of NKTinv cells, then a broad CD1d-αGC-specific TCR repertoire should be generated by random rearrangement. Using recombinant human CD1d-tetramers loaded with αGC, we tested this hypothesis and investigated whether Vα24−/CD1d-αGC-specific T cells could be expanded in vitro upon stimulation of human PBMC with α-GC. Our results unambiguously demonstrate the existence of human Vα24−/CD1d-αGC-specific T cells using a wide variety of TCR Vα- and Vβ-chains. Unlike conventional NKTinv cells, Vα24-independent CD1d-αGC-specific T cell populations only rarely express CD161, and are either CD4+ or CD8αβ+. PBMC were purified from healthy donors’ buffy coat by layering over Lymphoprep (Nycomed, Asker, Norway). Monocytes were then positively selected using magnetic beads coated with anti-CD14 mAbs (MACS; Miltenyi Biotec, Bergisch Gladbach, Germany). The monocyte-depleted lymphocyte fraction (CD14-negative) was frozen until needed. Monocytes were cultured in cell growth medium (RPMI 1640, Sigma-Aldrich, Dorset, U.K.; 10% FCS, 2 mM l-glutamine; Life Technologies, Paisley, U.K.; 1 mM nonessential amino acids, 1 mM sodium pyruvate, 55 μM 2-ME, penicillin G, and streptomycin; Life Technologies, Paisley, U.K.), containing 50 ng/ml GM-CSF (Novartis, Basel, Switzerland) and 1000 U/ml IL-4 (15). The monocytes were plated in 6-well costar plates at 4 × 105 cells/ml (3 ml/well). After 4 days, maturation was induced in some wells by adding either bacterial LPS (final concentration 1 μg/ml LPS of Salmonella abortus equi; Sigma-Aldrich), 50 ng rTNF-α (R&D Systems, Minneapolis, MN), or 4 × 104 irradiated (6 Gy) CD40L-expressing B cells (16). Immature and matured monocyte-derived dendritic cells (Mo-DC) were used for phenotypic analysis and in vitro priming after 6 days in culture, i.e., 40 h after induction of maturation. Monocyte-depleted or total PBMC were plated in 24-wells at 1 × 106 cells/ml in cell growth medium. The following culturing conditions were chosen: 1) Freshly isolated or thawed PBMC (2 × 106) from a single donor, cultured in the presence of 100 nM αGC (KRN7000; Kirin Brewery, Gumna, Japan); 2) Coculture of 2 × 106 monocyte-depleted, thawed lymphoctes and 2 × 105 autologous, αGC-pulsed immature or matured Mo-DC, respectively. For pulsing of Mo-DC with αGC, cells were cultured for 2 h in 24-wells in a volume of 200 μl RPMI 1640 containing 1 μM αGC, followed by addition of 2 × 106 lymphocytes in 1.8 ml of the above medium (i.e., 100 nM final αGC concentration). After 5 days, IL-2 was added to cultures (25 IU/ml). Thereafter, cultures were fed every 3–4 days with fresh medium containing IL-2 (1000 U/ml). The following Abs and tetramers were used to stain single-cell suspensions of Mo-DC and in vitro stimulated T cell cultures: purified anti-CD86 (BD Pharmingen, San Diego, CA), -CD83 (Immunotech, Marseille, France), -MHC-class II (mAb L243; American Type Culture Collection, Manassas, VA), -MHC-class I (mAb W6/32; American Type Culture Collection), and PE-conjugated goat-anti-mouse pan IgG (Southern Biotechnology Associates, Birmingham, AL); allophycocyanin- and PE- conjugated human CD1d tetramers loaded with either αGC or α-mannosylceramide (αMC) were generated as previously described (17); FITC- and PE-anti-human TCR Vα24, FITC anti-human TCR Vβ11 (Serotec, Oxford, U.K.), FITC-anti-CD3, -CD4, -CD8α, PE-anti-CD4 (all from DAKO, Kobenhavn, Denmark), FITC-anti-CD161, PerCP-anti-CD8α, allophycocyanin-anti-CD8α, -CD3 (all from BD Pharmingen), FITC-anti-TCR Vβ1, -Vβ9, -Vβ12, -Vβ16, -Vβ18, -Vβ23, and PE-anti-CD8β (all from Immunotech). Cells were stained on ice for 30 min, washed twice in ice-cold PBS/1% FCS, and directly analyzed. In some experiments (Fig. 4⇓a), cells were first stained with anti-TCR Vβ Abs, followed by CD1d-tetramers. In monomer competition experiments (Fig. 4⇓b), cells were first incubated with CD1d-αGC monomers for 20 min at room temperature before addition of CD1d-αGC tetramers on ice for another 30 min. Propidium iodide was used to gate out dead cells. For monomer-binding and chase studies (Fig. 9⇓a), cells were first incubated on ice with CD1d-αGC monomers for 30 min, washed twice in ice-cold PBS, stained with R-PE-Extraavidin (Sigma-Aldrich) on ice for 30 min, and washed twice with ice-cold PBS. Then, cells were either centrifuged and immediately fixed using 4% formaldehyde in PBS (chase time “0 min”) or incubated at 37°C 5% CO2 in a volume of 200 μl PBS for different chase periods (15, 30, and 60 min) before fixation. Samples were analyzed on a FACSCalibur flow cytometer, and data were processed using CellQuest software (BD Biosciences, San Jose, CA). For generation of clones and oligoclonal lines, Vα24−/CD1d-αGC-tetramer+ and Vα24+/CD1d-αGC-tetramer+ cells were sorted by a FACSVantage sorter into 96-well plates coated with 500 ng OKT3 Ab and restimulated with 1 μg/ml PHA (Sigma-Aldrich) and 1 × 105 irradiated feeder cells (allogenic PBMC and B cell line LG2) in medium containing 1000 IU/ml IL-2. Established lines and clones were fed every 3–4 days with fresh medium. To generate a polyclonal Vα24−/CD1d-αGC-tetramer+ line, 3 × 103 cells were sorted into OKT3-coated 96-wells and cultured in 200 μl of IL-2 containing medium in the presence of feeder cells. Purity of all lines was checked after 3 wk. Clones and oligoclonal lines were restimulated once with PHA and feeder cells, while the polyclonal line was snap frozen in RNAzol (Biogenesis, Poole, U.K.) until further use for spectratype analysis of TCR usage. TCR Vα24-positive and -negative lines and clones were used as effector cells in a 5-h 51Cr release assay 14 days after restimulation. Human CD1d-expressing C1R cells (C1R-CD1d) were used as target cells. C1R-CD1d were labeled for 90 min with 51Cr and at the same time pulsed with either 1 μM αGC, 1 μM αMC, or vehicle, followed by extensive washing in warm RPMI 1640. In CD8-blocking experiments, cells were cultured in the presence of the CD8-blocking Ab, MF8 (18), or an irrelevant isotype-matched control Ab at 1/100, 1/500, and 1/1000 dilution of ascites. Cells were cultured in triplicate in 96-well round bottom microtiter plates. E:T ratios were 1:1, 3:1, and 9:1. Maximum release was determined from supernatants of cells that were lysed by addition of 5% Triton X-100, and spontaneous release was determined from target cells incubated without effector cells. Percent specific lysis was expressed as (cpm of sample − cpm of spontaneous release)/(cpm of maximum release − cpm of spontaneous release). Anti-CD8-mediated inhibition of specific lysis by D5.1 and D6.1 (Fig. 8⇓b) was expressed as (1 − [% lysis MF8 C1R-CD1d/αGC − % lysis MF8 C1R-CD1d/vehicle]:[% lysis CT C1R-CD1d/αGC − % lysis CT C1R-CD1d/vehicle]. A total of 2.5 × 105 T lymphocytes were cultured in 48-well plates in the presence of either glycolipid-pulsed C1R-CD1d (see Materials and Methods) or 10−7 M PMA (Sigma-Aldrich) and 1 μg/ml ionomycin (Sigma-Aldrich). After 90 min, 10 μg/ml brefeldin A (Sigma-Aldrich) was added to the cultures to block cytokine secretion. After 6 h in culture, cells were washed twice in PBS and fixed in 2% paraformaldehyde. Intracellular cytokine staining was performed after permeabilization of cells with FACS permeabilization buffer (BD Biosciences), using the following Abs from BD Pharmingen: FITC-anti-IFN-γ, PE-anti-IL-4, PE-anti-IL-13, and allophycocyanin-anti-IL-2. Four-color analysis was performed on a FACSCalibur flow cytometer (BD Biosciences). Total RNA was extracted from a pure TCR Vα24−/CD1d-αGC-tetramer+ polyclonal cell line (see Materials and Methods) using RNAzol reagent according to the manufacturer’s instruction, and sscDNA was synthesized by reverse transcription using Moloney murine leukemia virus reverse transcriptase and an oligo(dT) adaptor in a reaction volume of 50 μl. Oligonucleotides used to analyze the 32 different TCR Vα and 24 different TCR Vβ families, as well as the Cα- and Cβ-specific primers, have been described (19, 20). Each TCR Vα- and TCR Vβ-PCR product was then used as a template for extension, or run-off, reactions using Cα- and Cβ-specific nested fluorescent primers, respectively. The fluorescent run-off products were subjected to gel electrophoresis in an automated DNA sequencer (PerkinElmer, Bucks, U.K.), and CDR3 size distribution and signal intensities were analyzed with GeneScan software (PerkinElmer). Analysis of Vβ-joining (Jβ) segments was conducted in the same way using previously described fluorescent Jβ-specific oligonucleotide probes (20). We and others have recently demonstrated that CD1d-tetramers loaded with αGC can be used for sensitive detection of human and mouse CD1d-αGC-specific NKTinv cells (17, 21, 22). Among freshly isolated PBMC from healthy donors, the frequency of Vα24+Vβ11+NKTinv cells ranges from 0.01 to 1.0%. The frequency of Vα24-negative/CD3+ cells binding to CD1d-αGC-tetramer in fresh PBMC samples from healthy donors was very low, and could not be confidently distinguished from background staining (data not shown). In contrast, distinct TCR Vα24-negative T cells stained by CD1d-αGC-tetramers (Vα24−/CD1d-αGC-tetramer+ T cells) could be expanded in vitro from all seven donors tested, to frequencies ranging from 1.0 to 5.5% (Fig. 1⇓, and data not shown). The percentage of Vα24−/CD1d-αGC-tetramer+ T cells varied significantly with different stimulation protocols. Interestingly, stimulation with αGC-pulsed mature autologous Mo-DC was required for efficient expansion of Vα24−/CD1d-αGC-tetramer+ T cells in some donors (Fig. 1⇓, a–c), while addition of αGC alone (without Mo-DC) was sufficient to visibly expand Vα24−/CD1d-αGC-tetramer+ T cells in other subjects (Fig. 1⇓d). In all donors, we observed a greater expansion of Vα24−/CD1d-αGC-tetramer+ cells when mature, rather than immature, αGC-pulsed Mo-DC were used for stimulation (Fig. 1⇓ and data not shown). CD1d-tetramers loaded with α-mannosylceramide (αMC) failed to stain both Vα24+Vβ11+NKTinv cells and Vα24− T cells, confirming the specificity of binding of CD1d-α-GC-tetramers (data not shown). These results demonstrate that recognition of CD1d-αGC in humans is not limited to the invariant Vα24+Vβ11+ TCR, and they are consistent with the possibility that a broader T cell population may be capable of specifically recognizing αGC presented by CD1d molecules. To address this hypothesis, we analyzed the TCR usage and Ag specificity of Vα24−/CD1d-αGC tetramer+ cells. Expansion of Vα24−/CD1d-αGC-tetramer+ T cells. PBMC from Donor 6 were cocultured with 100 nM αGC alone (a), αGC-pulsed immature Mo-DC (b), or CD40L-matured, αGC-pulsed Mo-DC (c). d, PBMC from donor 7 were cultured in the presence of 100 nM αGC without added Mo-DC. 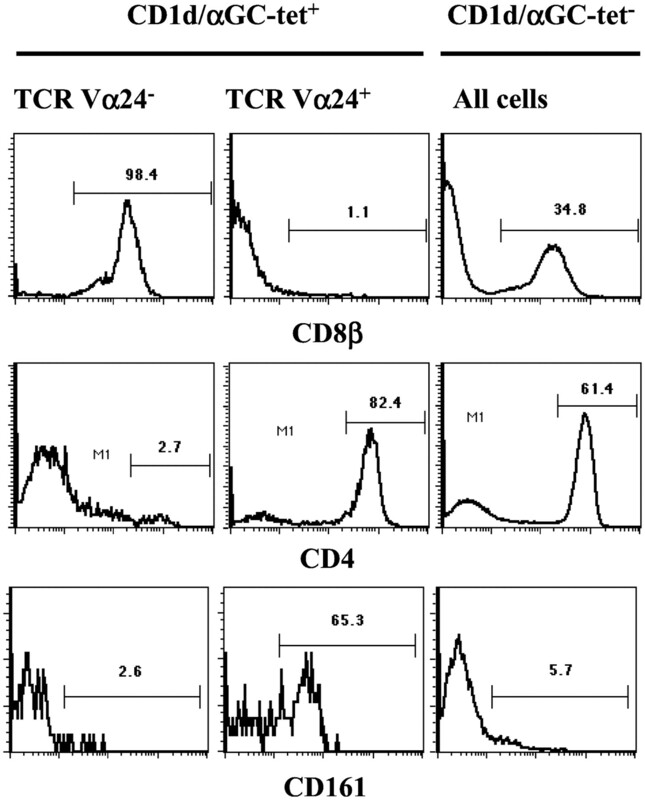 Percentages at day 16 of the T cell culture of Vα24+/CD1d-αGC-tetramer+ and Vα24−/CD1d-αGC-tetramer+ T cells are shown. 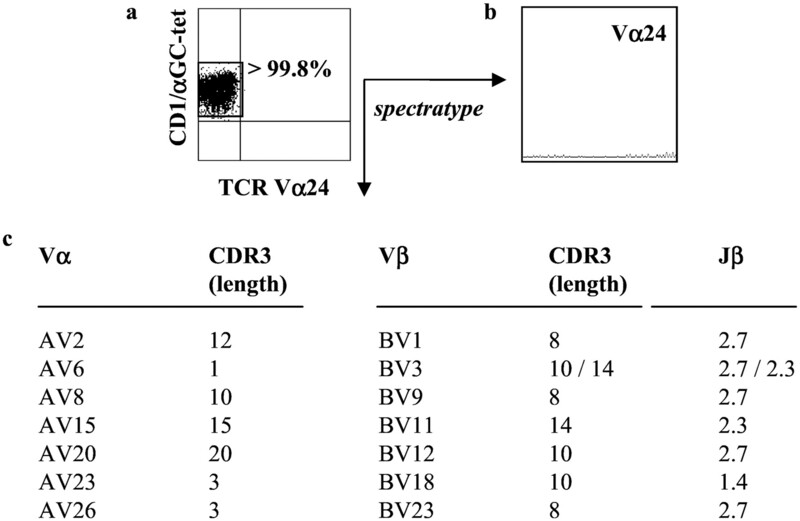 Human Vα24+Vβ11+NKTinv lymphocytes use TCR Vβ11 domains with various CDR3β regions (23). In contrast, the murine equivalent to human Vα24+Vβ11+NKTinv lymphocytes, Vα14-Jα281+NKTinv lymphocytes, use at least five different TCR Vβ families with polyclonal CDR3 regions (6). For these reasons, it has been speculated that the Vβ-chain does not contribute to the specific recognition of CD1d-αGC (21). When we compared staining of αGC-stimulated in vitro cultures with CD1d-αGC-tetramers and Abs against TCR Vα24 or Vβ11, we found that in all seven donors, a substantial proportion of Vα24−/CD1d-αGC-specific T cells expressed Vβ11 (Fig. 2⇓). In some donors, Vα24−Vβ11+/CD1d-αGC-tetramer+ cells comprised >90% of all Vα24−/CD1d-αGC-specific T cells (data not shown). A high proportion of Vα24−/CD1d-αGC-specific T cells express TCR Vβ11. PBMC from donor 1 were cocultured with LPS-matured, αGC-pulsed Mo-DC. Stainings were conducted with a, CD1d-αGC-tetramers and either Vα24-specific Abs; or b, A mixture of Vα24- and Vβ11-specific Abs. Percentages (on day 16 of the T cell culture) are shown for Vα24+/CD1d-αGC-tetramer+ (a), Vα24−/CD1d-αGC-tetramer+ (a), Vα24−Vβ11−/CD1d-αGC-tetramer+ (b), and CD1d-αGC-tetramer+/(Vα24 Vβ11)+ T cells (b). All density plots were gated on propidium iodide negative, CD3+ lymphocytes. To determine the usage of TCR Vα- and Vβ-chains of Vα24−/CD1d-αGC-specific T cells, we subjected a polyclonal Vα24−/CD1d-αGC-tetramer+ line (Fig. 3⇓a) to spectratype analysis (Fig. 3⇓, b and c). Fig. 3⇓c shows TCR Vα families, TCR Vβ families, and Jβ segments identified by spectratype analysis of this Vα24−/CD1d-αGC-specific line. Prominent expansions for seven different TCR Vα-families (AV2, AV6, AV8, AV15, AV20, AV23, and AV26) and seven different TCR Vβ-families (BV1, BV3, BV9, BV11, BV12, BV18, and BV23) with different CDR3 lengths, also within the same family (BV3), were found in this donor (supplementary data showing expansions of Vα and Vβ families are appended). TCR Vα, Vβ, and Jβ usage of Vα24-independent CD1d-αGC-specific T lymphocytes. A polyclonal Vα24−/CD1d-αGC tetramer+ line from Donor 4 was generated as described in Material and Methods. a, The Vα24−/CD1d-αGC tetramer+ phenotype and purity of this line was confirmed before isolation of mRNA for spectratype analysis. b, Spectratype analysis on cDNA from this line ruled out contamination by TCR Vα24-expressing cells. c, Positive results of the spectratype analysis are shown for each Vα or Vβ family, together with the amino acid length of the corresponding CDR3 region. c, Positive results for Jβ segments are also shown. a, The density plot was gated on propidium iodide negative, CD3+ cells. Guided by the results of the spectratype analysis, we then screened five Vα24−/CD1d-αGC-tetramer+ oligoclonal lines and one Vα24−/CD1d-αGC-tetramer+ clone obtained from the same donor, with anti-TCR Vβ-Abs. Consistent with the results from the spectratype analysis, three lines expressed TCR Vβ1, and two lines and the clone were TCR Vβ11-positive (data not shown). Preincubation of a pure Vβ1+ line with an anti-Vβ1-specific mAb, but not with an anti-TCR Vβ11 Ab, significantly reduced staining by CD1d-αGC tetramers (Fig. 4⇓a). Likewise, preincubation of an oligoclonal, Vβ1+ and Vβ11+ line with anti-Vβ11 Ab selectively reduced tetramer staining of Vβ11+ cells (data not shown). These results formally demonstrated that staining of these Vα24− T cell lines by CD1d-αGC tetramers was due to tetramer-binding to the TCR, rather than to other receptors. Consistent with these results, CD1d-αGC tetramer-staining of Vα24−/CD1d-αGC tetramer+ T cell lines could be partially blocked by preincubation with an excess of CD1d-αGC monomers (Fig. 4⇓b). Taken together, these results demonstrate that αGC not only stimulates Vα24+Vβ11+NKTinv lymphocytes, but can also efficiently induce a CD1d-αGC-specific polyclonal, Vα24-independent T cell response. TCR Vβ11 is overrepresented among Vα24−/CD1d-αGC-specific T cells, suggesting either an inherent affinity of Vβ11 to CD1d or its direct involvement in specific recognition of CD1d-αGC. To further assess Ag specificity of Vα24−/CD1d-αGC-tetramer+ T lymphocytes, we studied their capacity to specifically lyse CD1d-transfected C1R cells (C1R-CD1d) pulsed with αGC, αMC, or vehicle (Fig. 5⇓). These results demonstrated that both CD4+ and CD8αβ+Vα24−/CD1d-αGC-tetramer+ T cells are highly efficient in specifically lysing αGC-pulsed, but not unpulsed or αMC-pulsed, C1R-CD1d (Fig. 5⇓). In the same experiment, levels of specific lysis were similar for Vα24−/CD1d-αGC-tetramer+ T cells and Vα24+Vβ11+NKTinv (data not shown). Specific cytotoxicity of Vα24−/CD1d-αGC-tetramer+ T lymphocytes. C1R-CD1d cells, pulsed with α-GC (▪), α-MC (▴), or vehicle (•) were used as targets in a standard 5-h 51Cr-release assay. The CD4+Vα24−/Vβ11+ clone 2A (left panel), the CD4+ Vα24−/Vβ1+ line 1D (>99% Vα24−/CD1d-αGC tetramer+; middle panel), and the CD8αβ+Vα24−/Vβ11+ line D5.1 (>99% Vα24−/CD1d-αGC tetramer+; right panel) were used as effector T cells at the indicated E:T ratios. To determine the potential of cytokine production, Vα24+Vβ11+NKTinv and Vα24−/CD1d-αGC-specific T cell lines were stimulated with either glycolipid-pulsed C1R-CD1d or PMA and ionomycin. Fig. 6⇓ shows the results of the CD4+Vα24−/CD1d-αGC-specific T cell line 2c, which secreted IL-2 (data not shown) and IFN-γ, as well as IL-13 and IL-4. Other Vα24−/CD1d-αGC-specific lines produced mainly IL-2, IFN-γ, and IL-13, but not IL-4, while the Vα24−/CD1d-αGC-specific clone 2A, which specifically killed αGC-pulsed C1R-CD1d (Fig. 5⇑), did not secrete IFN-γ. In contrast, all tested Vα24+Vβ11+NKTinv lines produced IL-2, IFN-γ, IL-4, and IL-13 (data not shown), as it has been previously shown by others (1). These results suggested that Vα24−/CD1d-αGC-specific T cells have the potential to produce a broad range of different cytokine profiles. Intracellular cytokine staining of Vα24−/CD1d-αGC-tetramer+ T lymphocytes. 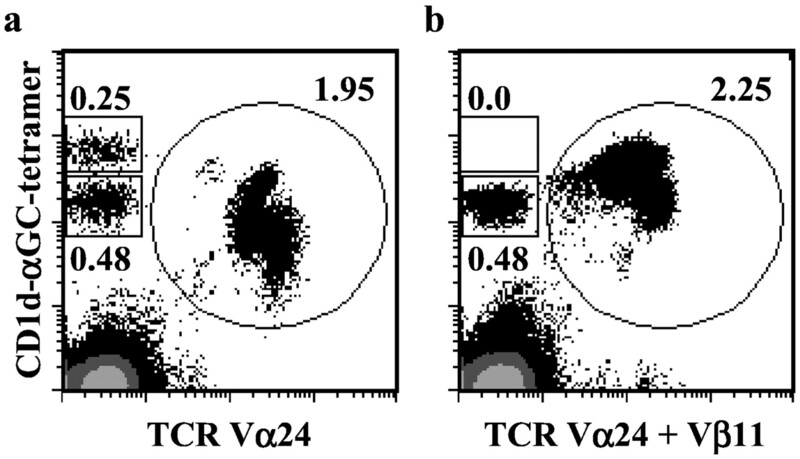 C1R-CD1d cells pulsed with αGC (top panel) or αMC (middle panel) were used to stimulate Vα24−/CD1d-αGC-tetramer+ T cells as described in Materials and Methods. For maximum stimulation, T cells were incubated with PMA and ionomycin (P+I; bottom panel). Results shown were obtained using line 2C (>99.8% pure for Vα24−/Vβ1+CD1d-αGC-tetramer+ T cells), and are representative of two separate experiments. Mouse and human NKTinv cells are either CD4+CD8− or CD4−CD8− (DN), whereas to date no CD8αβ-expressing αGC-specific NKTinv cells have been described (1, 24). We observed that a significant proportion of Vα24−/CD1d-αGC-specific T cells in several donors were CD8αβ+CD4− (Fig. 7⇓), while all other Vα24−/CD1d-αGC-specific T cells were CD4+CD8− (data not shown). In contrast, DN Vα24−/CD1d-αGC-specific T cells were not found in any of the seven donors analyzed (data not shown). To investigate the role of CD8 in Vα24−/CD1d-αGC-specific T cell lines, we assessed whether lysis of αGC-pulsed C1R-CD1d cells by CD8αβ+Vα24− cells could be inhibited by the presence of an anti-CD8 blocking Ab (18). 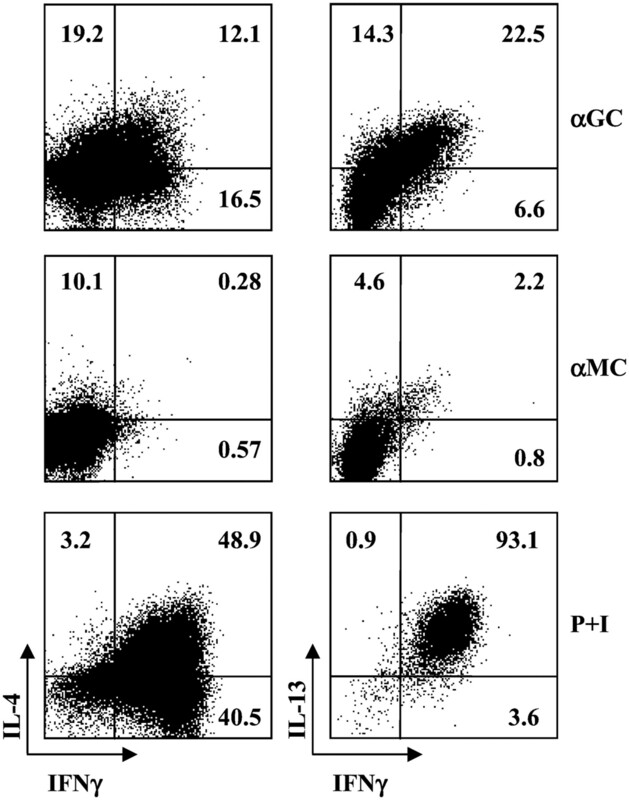 The results of these experiments showed that incubation with anti-CD8 blocking Ab, but not with an irrelevant isotype-matched control Ab, significantly reduced specific lysis of αGC-pulsed C1R-CD1d cells (Fig. 8⇓). Phenotype of CD1d-αGC-specific T lymphocytes. Cells from donor 6 were stained with CD1d-αGC-tetramer, anti-Vα24, and either anti-CD8β (top panel), anti-CD4 (middle panel), or anti-CD161 (bottom panel) Abs, 2 wk after in vitro stimulation with 100 nm αGC. Histogram plots were gated on Vα24−/CD1d-αGC-tetramer+, Vα24+/CD1d-αGC-tetramer+, or CD1d-αGC-tetramer-negative cells as indicated. Percentages of CD8β+, CD4+, and CD161+ cells in the gated population are shown. Propidium iodide was used to gate out dead cells. Role of CD8 coreceptor in Vα24-independent specific cytotoxicity against αGC-pulsed C1R-CD1d. C1R-CD1d cells pulsed with αGC or vehicle were used in a 51Cr-release assay as targets for CD8αβ+Vα24−/CD1d-tetramer+ T cell lines D5.1 (a and b), and D6.1 (b) in the presence of either the anti-CD8 blocking Ab MF8 (αGC-pulsed: ▴; vehicle-pulsed: ⊗) or irrelevant isotype-matched control Ab CT (αGC-pulsed: ▪; vehicle-pulsed: ○) at 1:100 (a and b) or 1:1000 (b) dilutions. b, Results were obtained at a 9:1 E:T ratio. Although the great majority of αGC-specific mouse and human NKTinv cells express CD161 (or NKR-P1), an NK-locus-encoded C-type lectin, it has been reported that CD161 is down-regulated after in vitro stimulation with anti-CD3 Ab (25). In contrast, another study described the expression of CD161 by a large proportion of Vα24-JaQ+Vβ11+ cells upon stimulation of PBMC with αGC-pulsed Mo-Dc (26). We compared expression of CD161 on Vα24− and Vα24+CD1d-αGC-specific T cells from the same culture, 2 wk after stimulation with αGC. At this time point, CD161 was expressed on the majority of Vα24+Vβ11+NKTinv cells, but it was detected only on a small minority of CD4+CD8αβ−Vα24−CD1d-αGC+-tetramer positive cells (Fig. 7⇑). CD161 was virtually absent on CD8αβ+Vα24−CD1d-αGC+-tetramer positive cells (Fig. 7⇑ and data not shown). Mouse Vα14+NKTinv cells have been previously shown to bind CD1d-αGC monomers (21). Our results demonstrate that human CD1d-αGC monomers were capable of binding to a DN Vα24+Vβ11+ line, while they failed to stain a panel of CD8αβ+Vα24−CD1d-αGC-specific T cell clones and lines (Fig. 9⇓a and data not shown). As a control, we showed that CD3 expression levels and intensity of tetramer-staining for CD8αβ+Vα24− and DN Va24+CD1d-αGC-specific cells were identical (Fig. 9⇓b and data not shown). Monomeric CD1d-αGC complexes were capable of staining a large fraction of the DN Vα24+Vβ11+ line and dissociated with a half-life of ∼50 min (Fig. 9⇓a and data not shown). Together these results suggested that compared with DN Vα24+Vβ11+ cells, TCRs of CD8αβ+Vα24−CD1d-αGC-specific cells have a lower affinity for CD1d-αGC. Binding of monomeric CD1d-αGC complex to DN Vα24+/Vβ11+ and CD8αβ+Vα24−/Vβ11+ T cells. 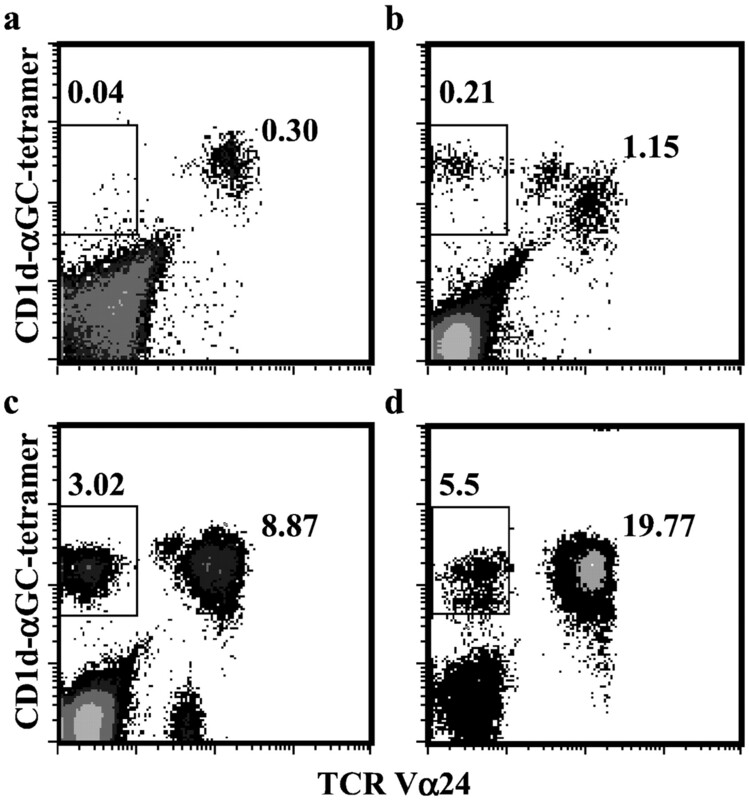 Cells were sequentially stained with CD1d-αGC monomers and RPE-Extraavidin (a; bold lines), or CD1d-αGC tetramers (b; bold lines), or RPE-Extraavidin (a and b; gray area) only, as described in Material and Methods. a, Cells were incubated at 37°C for 0, 15, 30, or 60 min (chase) after RPE-Extraavidin staining. All cells were fixed in formaldehyde before analysis. Percentages of monomer- and tetramer-stained cells are shown for each histogram plot. The glycolipid-presenting CD1d molecule is highly conserved among mammalian species and exhibits distinct cross-specific recognition by conserved DN or CD4+ lymphocyte subsets coexpressing an invariant TCR Vα24-JαQ segment paired to Vβ11 and CD161 (NKR-P1) (3). These NKTinv specifically recognize the marine-sponge-derived, synthetic glycolipid αGC, while the natural ligand seen by these cells in vivo remains unknown (5). Recent evidence from mouse studies indicates that NKTinv cells do not develop from separate precursor cells committed to this sublineage before variable-gene rearrangement, but branch off the mainstream developmental pathway because of their TCR specificity (11, 12, 13, 14). Therefore, we reasoned that recognition of CD1d-αGC may not be uniformly restricted to NKTinv cells bearing the canonical TCR Vα24-JαQ chain, but may also be mediated by other randomly generated TCRs. We and others have recently described the use of rCD1d-tetramers loaded with αGC for sensitive and specific identification of both murine invariant Vα14-Jα281+ or human Vα24+Vβ11+NKTinv cells (17, 21, 22). Using different in vitro culture conditions in combination with the use of human CD1d-αGC-tetramers, we tested the hypothesis that human T lymphocytes, other than the “conventional” CD161+Vα24+Vβ11+NKTinv subset, can recognize CD1d-bound αGC. Distinct Vα24-negative T cell populations binding to CD1d-αGC-tetramers were detected in all seven healthy donors’ PBMC after in vitro stimulation with αGC-pulsed matured Mo-DC (Fig. 1⇑). In two donors, addition of αGC alone (without Mo-DC) was sufficient to visibly expand Vα24−/CD1d-αGC-specific T cells (Fig. 1⇑d and data not shown), suggesting that these cells were expanded in vivo, albeit at a frequency below the threshold required for tetramer staining. Specificity of these novel T cell subsets for CD1d-αGC complex was demonstrated in several ways. First, Vα24−/CD1d-αGC tetramer+ lines and clones specifically lysed αGC-pulsed, but not unpulsed or αMC-pulsed C1R-CD1d cells, ruling out ligand-independent recognition of CD1d (Fig. 5⇑). 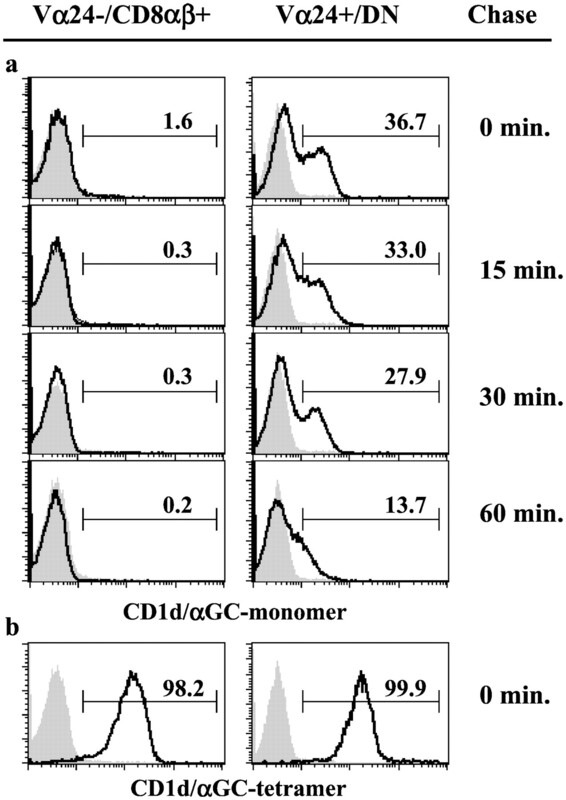 Second, addition of monomeric CD1d-αGC complexes efficiently prevented staining by CD1d-αGC tetramers (Fig. 4⇑b). Finally, preincubation with TCR-specific Abs significantly reduced specific staining by CD1d-αGC tetramers (Fig. 4⇑a). Consistent with a mainstream model of NKTinv cell selection, spectratype analysis demonstrated that Vα24−/CD1d-αGC-specific T cells can use a wide variety of Vα and Vβ segments (Fig. 3⇑). However, a marked bias was observed for the use of Vβ11 (Fig. 2⇑ and data not shown), with >90% of Vα24−/CD1d-αGC-specifc T cells using Vβ11 in some donors (data not shown). Previous tetramer-based analysis of NKTinv cells in mice have suggested that the CDR3β regions are permissive, but do not specifically contribute to the recognition of CD1d-αGC complexes (21). Similar to the observation that some Vβ regions have inherent affinity for MHC class II molecules (27), human Vβ11 regions may have inherent affinity for CD1d molecules. Alternatively, the Vβ11 regions in Vα24−/CD1d-αGC-specifc T cells may contribute more specifically to the recognition of CD1d-αGC complexes. “Conventional” NKTinv in humans and mice exhibit a CD4+ or a DN phenotype (1). In contrast, all Va24−/CD1d-αGC-specific T cells in our seven donors were either CD4+ or CD8αβ+, but they were never DN (Fig. 7⇑ and data not shown). Importantly, specific lysis of αGC-pulsed CD1d-expressing targets by CD8αβ+Vαβ24−/CD1d-αGC-specific lines was significantly reduced in the presence of an anti-CD8 blocking Ab (Fig. 8⇑), demonstrating that CD8αβ can act as a coreceptor for human glycolipid-specific CD1d-restricted T cells. Previous studies in mice have provided evidence that CD1d binds CD8 and not CD4 (7, 11, 12). Lantz and Bendelac (11) have shown that in Vα14-Jα281-transgenic mice, the CD8-compartment is selectively depleted of Vβ7 and Vβ8, i.e., the main Vβ-chains used by mouse Vα14-Jα281 NKTinv cells. The same group found that Vα14-Jα281 NKTinv were lost in CD8 transgenic mice, suggesting that CD8αβ-expressing NKTinv cells are negatively selected during thymic development due to excessive avidity (12). This model predicts that NKTinv cells bear TCRs with a high inherent affinity for CD1d loaded with either αGC or its natural “αGC-like” ligand. Our observation that monomeric CD1d-αGC complex can efficiently bind to DN NKTinv cells, but not to CD8αβ+Vα24−CD1d-specific T cells (Fig. 9⇑a) is highly consistent with such a model. In addition, it has been previously demonstrated that higher affinities of the TCR-peptide/MHC interaction favor the development of a CD4+ phenotype, whereas lower affinities result in a CD8+ phenotype (28, 29), and that TCR binding energetics can determine the expression of NKR-P1 by NKTinv cells (30, 31, 32). Among Vα24−/CD1d-αGC-specific T cell subsets in the subjects we studied, CD161 was rarely expressed on CD4+ cells (data not shown), and was absent from CD8αβ+ cells (Fig. 7⇑). Based on these results, we hypothesize that in humans, a wide variety of CD1d-αGC-specific TCRs are generated by random TCR rearrangement, and that the binding affinity of a given TCR-CD1d/αGC interaction is a key determinant in CD4/CD8αβ/DN lineage commitment and CD161 expression. The fact that Vα24−/CD1d-αGC-specific T cells can express CD8αβ and exhibit CD8-dependent cytotoxicity (Figs. 7⇑ and 8⇑) is consistent with a lower affinity TCR for CD1d-αGC in these CD8αβ+ cells compared with conventional CD8αβ−Vα24+/Vβ11 NKTinv cells, and the clear difference in CD1d-αGC monomer staining between CD8αβ+ and DN Vα24+CD1d-specific T cells (Fig. 9⇑a) supports this hypothesis. Hence, it is possible that higher surface density of CD1d loaded with α-GC (or its natural ligand) may be required for expansion of Vα24−/CD1d-αGC-specific T cells compared with NKTinv. Although the identity of the α-GC-like natural ligand is not known, it is tempting to speculate that conditions associated with an increased synthesis of the “α-GC-like” natural ligand in vivo may lead to the expansion of Vα24−/CD1d-αGC-specific T cells. Likewise, injection of αGC in vivo for therapeutic reasons may induce expansion of Vα24−/CD1d-αGC-specific T cells. Phase I clinical trials, investigating the safety profile of weekly i.v. αGC injections in patients with solid malignant tumors are currently underway (33). Based on our findings, it is possible that CD4+ and CD8+Va24−/CD1d-αGC-specific T cells expand in a proportion of patients receiving αGC. Because the in vivo function of these cells is still unknown, we suggest that tetramer-based monitoring of Vα24−/CD1d-αGC-specific T cells as well as NKTinv cells should be considered in patients receiving αGC. In conclusion, we have demonstrated that specific recognition of CD1d-αGC complex can be mediated by human Vα24-JαQ-independent T cell subsets, which use a variety of TCR Vα and TCR Vβ families. In contrast to conventional NKTinv cells, Vα24-independent T cells are never found in the DN compartment, while they can express CD8 αβ and exhibit CD8 coreceptor-dependent specific cytotoxicity. Furthermore, CD161 is only very rarely expressed by Vα24−/CD1d-αGC-specific T cells expanded in vitro. Finally, the existence of a diverse repertoire of CD1d-αGC-specific T cells in humans strongly supports their Ag-driven selection. It remains to be assessed whether Vα24-independent CD1d-αGC-specific T cells are elicited as a result of an adaptive immune response, more similar to MHC/peptide T cell responses, and whether they may have a different physiological role than conventional NKTinv cells. We thank Xiao-Ning Xu for providing the MF8 and CT Abs; Dawn Shepard for technical help; and Michael J. Palmowski, Uzi Gileadi, and Rod Dunbar for helpful discussions and critical reading of the manuscript. α-GC (KRN7000) was generously provided by Kirin Brewery (Gunma, Japan). ↵1 This study was funded by research grants from the Cancer Research U.K. and the Cancer Research Institute of United States of America. S.D.G. was funded by grants from the Swiss National Science Foundation, the Roche Research Foundation, and Novartis Stiftung. N.D. was funded by the French Institute National de la Santé et de la Recherche Médicale. ↵4 Abbreviations used in this paper: αGC, α-galactosylceramide; NKTinv, invariant NK T cell; DN, double negative; Mo-DC, monocyte-derived dendritic cell; αMC, α-mannosylceramide; Jβ, Vβ-joining. Giaccone, G., C. Punt, Y. Ando, R. Ruijter, N. Nishi, M. Peters, B. von Blomberg, R. Scheper, M. Roelvink, J. Beijnen, et al 2000. KRN7000, an NKT cell enhancer, in patients with solid tumors: a phase I study of the EORTC biological therapeutics development group. J. Clin. Oncol. 19: 477 (Abstr. ).